This is an add-on to The Brendan Rodgers System for FM14. 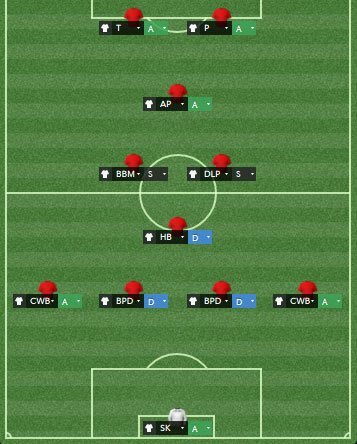 It is another formation for the same tactical system but I decided to release this one separately because it took me longer to recreate and this was the set up which Brendan Rodgers used during the second half of the season just gone, when his Liverpool side played arguably the best attacking football in the world at the time. 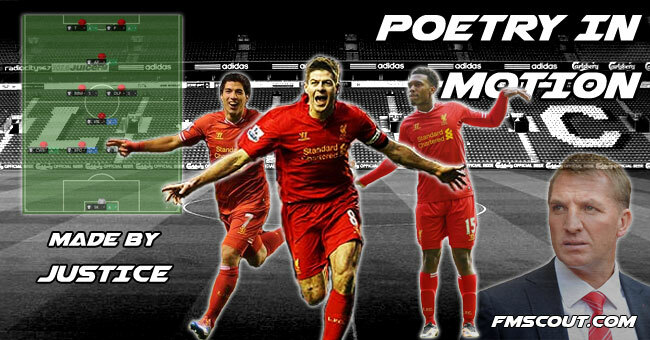 "Poetry In Motion" is a chant which has become popular amongst the Scouse supporters and I felt that it was an ideal name for this tactic. Brendan Rodgers' philosophy is one that is admired across the globe. His beliefs of how the game should be played has lead to some revolutionary football in the Premier League, first with Swansea, and currently with Liverpool. He believes in getting all the little things right. Keeping the ball is very important, and off-the-ball movement is clearly visible in this system. Defensively, he likes his team to put a lot of pressure on the opposing team. If you put your opponent under pressure, they have less time and space to work with, which may force them in to making mistakes. When his team has the ball, his players play a nice, flowing passing game with the ball always moving, making it impossible for the opposition to predict the next move. They try to keep all the basics as simple as possible, but if his players have the ability to make something happen, they will use these abilities to express themselves on the game, while sticking to the fundamentals of Rodgers' philosophy, his way of life. As you can see, it is the famous 4-1-2-1-2 of the current Liverpool side. It consists of a flat back four, a half-back playing just in front of the defence, two centre midfielders and one attacking midfielder behind the two strikers. The midfield is narrow which allows the two complete wing backs to charge up the flanks in to the space. This formation is designed to dominate the midfield area while having a strong presence up front and as well know, Liverpool's attack scored more than enough goals. This set-up is all about goal-getting and you can expect to see some thrilling attacks. These are the team instructions, these are the settings which defines how your team plays it's football. This is where you create your style of football, where your master plan for success comes together. For each formation, these team instructions are the same. My belief is that you shouldn't play your style depending on who you play against, but how you set up (your formations). My opinion is that you should let your team play the football which they are used to and don't change it around (team instructions). Philosophy: This is how your team acts through each phase of the game. You cannot see this in the screenshot above, but the Philosophy is set to Very Fluid. With a very fluid style, your attackers will help defend and your defenders will help attack. This helps with passing options, causing problems in your opposition's defence, and you have more players defending when needed too. Strategy: This is how you take on your opponent. I have the strategy set to Control as it's base strategy. With Control, your team will look to take control of the ball and move it around. This strategy is very good for a "passing team", which is what this entire system is looking to create. However, you can feel free to change the strategy to Attacking or Counter or whatever else during the pre-match team-talk. This changes the emphasis of play of you team but will not harm the tactic too much, in my opinion. Passing Style + Tempo: This is how you pass the ball and how quickly you play your football. This system utilises a very high tempo, short passing in a way to keep possession of the ball, even from defence. The faster and more accurately your team can move the ball around, the easier it will become to keep possession and to create good attacking moves. 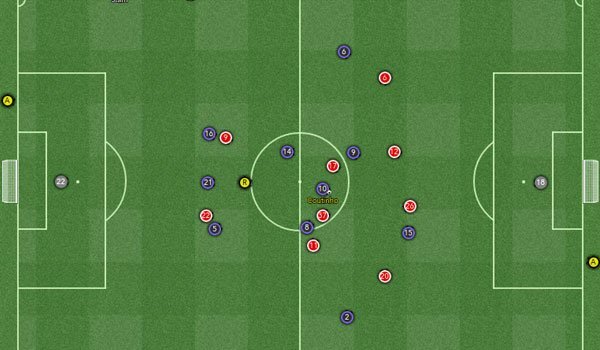 Attacking Play: This is how your team attacks the opposition, to state the obvious. Your defensive line will push very high up the pitch in an attempt to confine the game to the opposition's half. Your team will look to play narrower so that they aren't boxed off out wide, while your wing backs bomb down the flanks to overlap the wingers and cause havoc. Your most skilled players will look to express themselves on your attacking play to create a chance through flair or skill for either themselves or for a team mate. Defensive Play: This is how your team defends against opposition attacks, sorry for stating the obvious again! The only real instruction in Team Instructions regarding defending is to Hassle Opponents, which just means to really let your opponents know that your defenders are ready to make big tackles on them and to make life hard for them. There are more specific instructions for the defenders themselves rather than the system. Goalkeeper: The goalkeeper plays as a Sweeper Keeper. He does all the regular work of a Goalkeeper, with the addition of being included in the passing play. The difference is that with a regular Goalkeeper, you have 10 players and 1 goalkeeper, whereas with a Sweeper Keeper, you have 11 players with 1 of them being a goalkeeper too. Defender - Right & Left: The Complete Wing Back is responsible for defending his team's flanks, while also contributing to the attacking play. In this role, your Complete Wing Back will be a box-to-box player, bombing up and down the wing, and is almost always available to offload the ball to if there are no viable passing options in midfield or up front. Defender - Center, Right & Left: The central defenders are your defensive bricks. They are the most important players in your team and it is important that you get quality players for these positions. As Ball Playing Defenders, they join in on the passing and are very good with the ball at their feet. Defensive Midfielder: The Half Back is responsible for breaking down your opposition's attacks in front of your back four. He will sit in front of your defenders and protect them from any onslaught of opposing attackers. The Half Back needs to be a solid tackler, have good positioning and be a good passer for the passing moves. The Half Back will drop deep to pick up the ball from the keeper or the defenders and he will distribute it to whoever is in the best position. Midfielder - Center, Right: The MCR is the Deep Lying Playmaker. He will sit deeper in midfield and orchestrate your attacks. He must have a great array of passing ability and be very creative. He must also be a decent tackler to break up attacks alongside the DM. Midfielder - Center, Left: The MCL is the Box-to-Box Midfielder. He will run up and down the pitch for 90 minutes. He will be involved in every phase of the game, from defending your own goal line to trying to force a cross in to the goal. They must be good with the ball and have good stamina. Attacking Midfielder - Center: The AMC is an Advanced Playmaker. He looks to create chances for himself and for others. He will sit in behind the Striker and Inside Forwards and thread through balls in for them. He must have a reasonable shot and he must be a very creative passer of the ball. Striker - Right: This striker is an out-and-out Poacher. His role is to score the goals, whatever way he can. He must have good off-the-ball movement and be clinical when he gets his chances. If he is a good passer, that is a huge plus for your team. Striker - Left: This striker is a Trequartista. His role is to use his technical abilities to carve out chances. This player must be very skillful and very creative with the ball. He must also be a good marksman, as he will be expected to take his chances. Here is an image of a typical attacking move in this formation & style of play. We are looking at the team in black and purple, obviously. No.16 & No.5 are the two DCs and No.21 is the Half Back dropping deep to protect them and to offer a deeper passing option. No.2 & No.6 are the two Complete Wing Backs and they are bombing up the flanks in to space where they can be dangerous. No.8 & No.14 are the two Midfielders looking to get on the ball and add to the play. No.19 is the Attacking Midfielder who has picked up the ball and is looking to bring it forward and create with it. No.9 is the Trequartista who has dropped slightly deeper than his strike partner so he can pick up the ball and create something with it. No.15 is the Poacher and he is pushing forward in order to get in to a goal scoring position. This is Poetry In Motion. If you do decide to use this system, please take note that it may take several months for your team to become fully accustomed to this tactic, even if the familiarity bar is full. If your results at the start of the season are poor, this is not the tactic's fault. It is just that your players need to have more experience in this system in competitive matches. My recommended training approach would be on Ball Control, to get your team to be as good on the ball as possible, as you will have a lot of it. For match preparation, you can work on either attacking or defending set pieces, which is the norm for any team. If you are looking to train players for this system, train them in the roles which are included, so that they become familiar with them. Just remember, if you are patient with this system or any other system, it can succeed for you. Also, if your players are not technically gifted, this isn't the style of play for them. This system requires players who can manipulate the ball well and can control the play, rather than players who's main use is smashing heads. 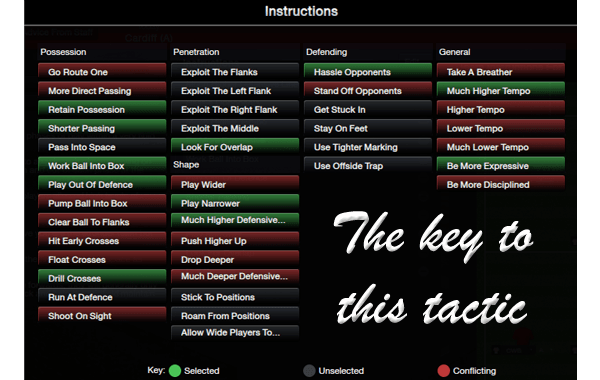 The 'Tactic' menu, located to the top right of the right panel, allows you to save and load different tactics. To Import or Export a particular tactic, select the 'Manage Tactics' option, which will display a dialog box. 'Import' will prompt you to select a tactic (.tac file) to import into the game, whilst 'Export' will prompt you to save it to a directory. The 'Delete', 'Copy', and 'Rename' options allow you further control over your physical tactics files. I highly recommend this system to those looking to play an attractive style of football, while still controlling the play. Be warned, it may take a while for your team to get used to this system. Also, I cannot guarantee that this tactic will be the best possible tactic for you. A tactic's success depends on the players used in this tactic. If your players do not suit this tactic, they won't perform well in it. This is just a different way of playing which will hopefully bring you success.I hope that you enjoy using this system and I hope you have success with it. Any criticisms you may have are welcome, I am always looking to learn where I can improve. Thank you! 15 comments have been posted so far. Yours and the Ancelotti's Madrid tactics are my favorite tactics from every FM forum I go to. I had so much fun studying your tactics and it taught me a great deal about the match engine and tactics creator. I am looking forward to experimenting with your "Jose Mourinho System"
I salute your enthusiasm. Thank you for your hard work. @alex8liverpool, that could be down to anything to be honest. Could be team selection, player morale, training, anything. No tactic guarantees results, as van Gaal's first game as Man Utd manager proved, but there are no over-lying weaknesses in this one. I've been using this as my attacking tactic for all of FM14 and while I do lose the odd game, it is down to player performances rather than a tactical weakness. This tactic works for some people, doesn't work for others. Sorry to offend but awful tactic so far.. played 7 lost 7. pathetic poor performances. every ball backwards. whats going wrong? @dark_boy, he is more than likely referring to the lack of width in your midfield. The only time that this would be a problem is if your opponent uses attacking full-back's along side attacking wingers, which could leave you exposed on the flanks. its a great tactics. I am using it on Arsenal now. But sometimes the assistant coach reminds that the team is outnumbered in the midfield. I saw that too. what could be the solution? @kells, neither influence a certain type of attacking football directly. You can play a deep line but have very attacking, direct football (route one) and you can also have very attacking narrow play, like this tactic. This tactic uses a very high line but is also very narrow. The reason for this is to compress the game to keep it in the opponent's half so they cannot escape. The thing is that there are many different ways of playing attacking football but the most traditional attacking football is wide play. will changing the much higher tempo to lower tempo be useful? Really good tactic especially if you want to play with 2 Strikers and Attacking Full Backs! Handcrafted in Symi, Hellas. Page created in 0.42 seconds.